If you get a bachelor’s degree, you want it to pay off. Don’t enroll in a university before researching New Hampshire’s best colleges by alumni salary. 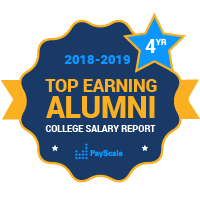 There are a small number of colleges and universities in New Hampshire included in PayScale’s College Salary Report list of best universities in New Hampshire. Among the most notable colleges in New Hampshire are: the University of New Hampshire, Southern New Hampshire University, Dartmouth College, Keene State College, and Plymouth State College. Prestigious Dartmouth College, located in the quaint town of Hanover, usually provides its graduates with the best median early-career salary of any other New Hampshire school. Many students go on to work in Software, Policy, and even become CEOs. While some Ivy League schools see big increases in earning power when we include graduates with advanced degrees, Dartmouth sees a modest increase per year in both median early and mid-career salary. Most other schools in New Hampshire see similar small increases when all alumni are included. Some of the other best four-year colleges by alumni-salary earning potential include: Saint Anselm College, private, and the University of New Hampshire, home of the Wildcats and ideally situated between the state’s mountains and sea coast in beautiful Durham, New Hampshire. Dartmouth is the most highly recommended college in the state: about 90 percent of alumni indicated that they would recommend the school to others. Dartmouth also has a low student to faculty ratio, with an undergrad enrollment of about 4,500. Dr. Seuss is just one of the famous alumni to graduate from New Hampshire colleges and universities. Other notables include: Meryl Streep, Robert Frost, and John Irving.